We are an engineering firm focussing on high end performance product design, development, and manufacturing for on and off track race vehicle markets. We design our own products and also offer engineering consulting services for both individuals and racing teams if you have something in mind. To be the premier source of functional race-inspired performance products while maintaining a grass-roots foundation; revolving around industry passion with attention to customers, their needs and our ability to accurately educate them. Involving ourselves in racing both on the track and in sponsorship form. This is the only true way to demonstrate our place in our market along with proving that our parts perform flawlessly. Our name should be synonymous with track-tested performance parts. Shane Wagner is an experienced degreed mechanical engineer and he has always had a passion of everything related to speed, performance, and engineering from classic American muscle cars to the high tech race cars of tomorrow. Proven Wicked is driven by this passion and was founded to bring a level of product and expertise to the market that is at a professional level. Our philosophy is to use that passion and combine it with our vast array of engineering expertise, retail sales experience, and aftermarket involvement to create the highest quality products possible by utilizing the best technology, testing to the highest standards, along with qualifying and appeasing our customers. Our initial offering will embrace the comeback of the muscle car and focus on the 2010 Camaro followed with offerings for C5/C6 Corvettes, 2005+ Mustangs, 2008+ Challengers, while continuing our roots in modernizing classic GM muscle cars like the Camaro and Chevelle. Unlike many of the sprouting “mom and pop” shops, our products are in a league of their own by being developed to the most stringent of engineering and industry standards backed with all necessary testing and analysis. With a seasoned Mechanical Engineer on staff, we will use only the best available manufacturing methods, materials, and hardware to produce product that is stronger, lighter, more streamline, safer, temperature resistant, innovative, and most importantly more functional that the competition. The idea behind our parts is taking professional race car and aerospace inspired technology and standards and applying those engineering advantages to our product for dual duty street/strip cars. To accomplish this we are taking over 10 years of engineering experience with the Big Three, professional race teams and top notch aftermarket companies and applying what we've learned to guarantee superior products. The core of the business is how the product development process is carried through each phase to produce a quality uncompromised end result in the most effective manner. To do this several of the latest technologies are being brought together of which are out lined below. 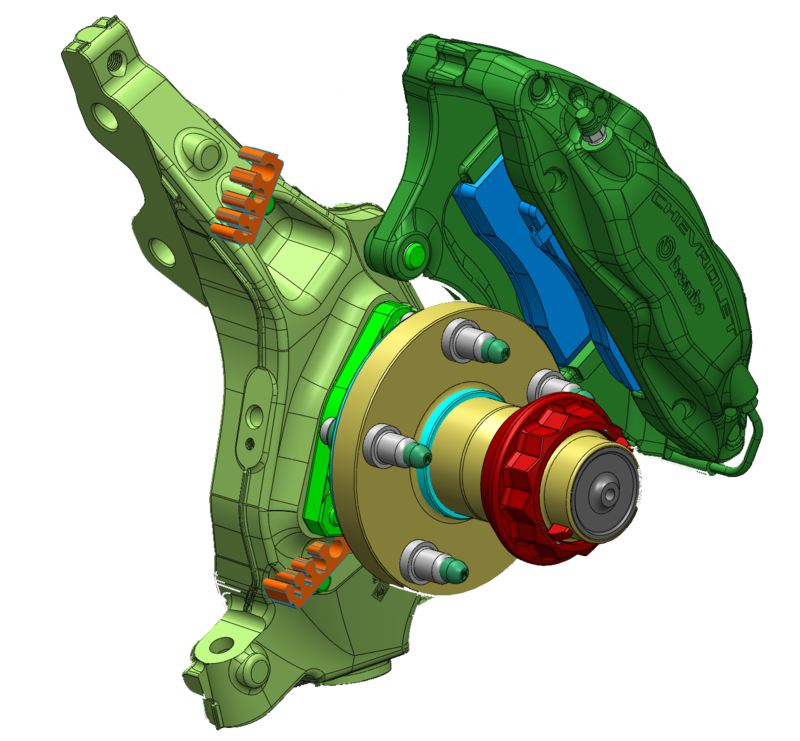 The industry standard for large corporations such as the Big Three in Detroit and large consumer products is to use CAD for designing and drawing product in 3D space. This data can be used in many ways from packaging with other components to using motion studies to observe how assemblies interact. This data can then be sent to manufactures to produce the product. In addition to creating our own data, we have access to OE data on most vehicle models as members of SEMA through the Tek-Transfer program. This allows us to request data that was used to build the vehicles including complete engine assemblies or complete suspension setups. This has proven to be extremely useful throughout the years and makes sure product fits within very strict tolerances and saves time in trying to measure on an actual vehicle. Part of the engineering process for stressed components is the type of load they can handle. One tool to initially check parts is using FEA. This is software that takes the CAD model of a product along with material specifications, load and constraint inputs and gives a very good prediction of where the maximum and minimum stresses are and how much the part will deflect. This information will let the designer know if the part will fail and change the design accordingly if needed. It is also a tool to optimize for weight savings and to predict how parts will function such as sway bars and bushings. This is a step of the design evolution before having to produce a prototype for real physical testing. The prototype process can be a tedious long affair and extremely expensive when part drawings need to be sent to a manufacturer to do a one off part especially when tooling is involved. Even worse after that investment, to find out that the part either doesn’t fit or meet expectations. One way to eliminate this problem is rapid prototyping. This is a process that will take CAD data and “print” it out in 3 dimensions. This will produce a very accurate plastic part that is representative of the model to be used for fitment and building assemblies. This is much more cost effective and time saving even with multiple iterations of the same product. 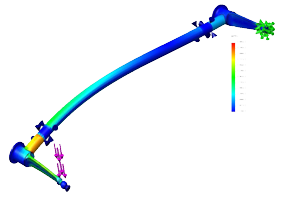 Since our core product and expertise is mostly suspension components an affective software for analyzing the dynamics is crucial. The program we use will take suspension pivot points and give extensive information on all the reactions of the vehicle through its travel. The stock vehicle can be compared to a vehicle that has modified suspension parts to show the improvements to the vehicle dynamics that they spawn. and gives you the customer confidence in our product.